345012678. That could be your password, or that could be a customer’s social security number. Almost untraceable, hidden pieces of data still exist when companies dispose of old or outdated data storage devices – even those their IT departments have supposedly wiped clean. However, just like washing a window with cleaner sometimes leaves a smudge or smear behind, trace amounts of data can remain on these devices. Those trace amounts could cost your company millions of dollars if they are the right bits of data. What’s on that old hard drive, anyway? 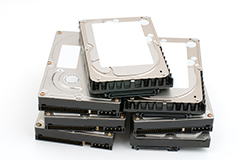 Sugar House Archives & Shred can destroy and recycle other data-containing devices. We destroy any memory-enabled device that has sensitive, personal, medical, or business information on it at our location in Salt Lake City, Utah, or onsite at your location. We can destroy your computer hard drives, copier hard drives, cell phones, SIM cards, smart phones, CDs, DVDs, floppy disks, flash drives, zip disks, backup tapes, PDAs, thumb drives, pagers, GPS devices, driver’s licenses, credit cards, membership cards, hotel key cards, badges, VHS tapes, cassette tapes, micro film, and x-rays. If you are interested in Sugar House Archives & Shred’s Hard Drive & Media Destruction services, please contact us by phone or fill out our form.